Travelling through Rajasthan is like walking through a kaleidoscope. Everywhere you look, colours dance before your eyes – from saris drying on riverbeds to the sunsets of Udaipur, from the spice market in Jodhpur to the white marble of the Taj Mahal. 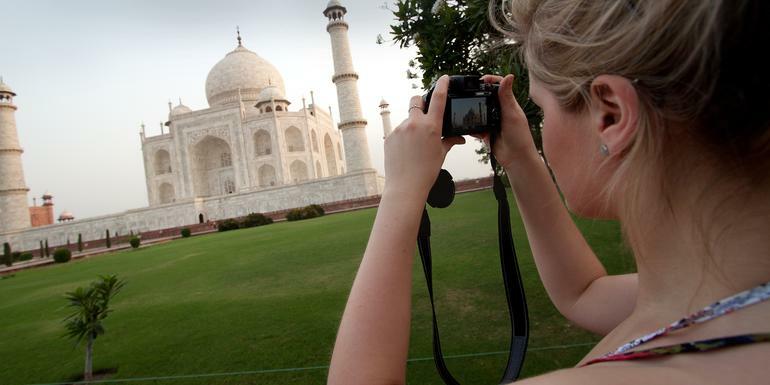 Uncover the secrets of romantic Rajasthan on this 15-day tour of the colourful Indian state. Marvel at the rampart views from Jodphur’s Meherangarh Fort, enjoy a safari in Ranthambore National Park, and then soak in the relaxed atmosphere of Udaipur. Your expert CEO will take care of the hassles – and travel days are well-paced and include private transport, so you’ll hit the sights refreshed. Be prepared to fall in love with India! Hotels (13 nts), sleeper train (1 nt). Your G for Good Moment: City Walk, Delhi. Old Delhi walk with stops at the Jama Masjid, Gurduwara, Chandni Chowk, and Connaught Place. Meherangarh Fort visit. Udaipur orientation tour with city palace visit. Cultural show at the Bagore-ki-Haveli. Sunrise at Savitiri Temple. Sunset camel ride. Amber Fort tour. Sunset visit to Ranthambore Fort. Safari in Ranthambore National Park. Abhaneri stepwell visit. Taj Mahal entrance. Agra Fort entrance and guided tour. All transport between destinations and to/from included activities. Jodhpur is located is northwestern India and is a trade center for the surrounding area.